Ein Kerem is a beautiful tranquil village and neighborhood in the west of Jerusalem. Surrounded by beautiful natural groves and the breathtaking landscape provided by the Jerusalem Hills, Ein Kerem is worlds away from the bustling center of Jerusalem which is just minutes away. The pretty houses made of local Jerusalem limestone, cobbled narrow streets, sit in the shadow of pretty churches whose bells sound down the streets. An important site for Christians as the birthplace of John the Baptist, Ein Kerem is incredibly popular with Israelis seeking to escape the city. 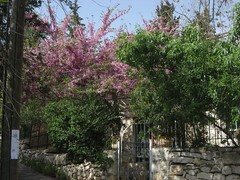 Many tourists choose to take a guided walking tour around Ein Kerem, although it is just as possible to do it yourself. The center of the village and location where all the walking tours begin is at the well. The breathtaking beauty, the elegant simplicity and the charm of this place are especially touching. There is grace in every fence, wall and path, and you can wander through the alleyways for hours, enjoying every moment. Modern developments have not yet reached this scenic neighborhood, and it remains a pastoral village, cut off from the bustle of the city. Ein Kerem is a pilgrimage site for many Christian visitors, as the village is believed to be the place where Elizabeth, the mother of John the Baptist, miraculously became pregnant and gave birth. Tradition teaches that during her pregnancy, Elizabeth was visited by a family relative – Mary, who was also pregnant, with Jesus and for this reason the village well is now called Mary’s Well. The village around the well grew and its waters are considered holy. Many pilgrims come to drink from the well and take the holy water away with them in bottles. 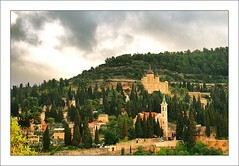 Today Ein Kerem has a number of active churches and monasteries. Ein Kerem is an important gem in Israel’s tourism crown, and will capture the heart of any visitor. There are many fine restaurants for connoisseurs and quaint guest rooms offering relaxing hospitality in authentic surroundings. Artists inspired by Ein Kerem’s beauty have settled here to paint and display their works to the public. Ein Kerem is truly a place worth visiting, with many charming treasures to enjoy.